Manchester United's trip to Derby and Chelsea's game at either Northampton or MK Dons in the FA Cup fourth round will be shown live on BBC One. United face Championship side Derby on Friday, 29 January (19:55 GMT). League Two Northampton or Championship outfit MK Dons face Chelsea on Sunday, 31 January (16:00 GMT). BT Sport will show Colchester v Leicester or Tottenham and Liverpool or Exeter v West Ham on Saturday, plus Yeovil or Carlisle v Everton on Sunday. 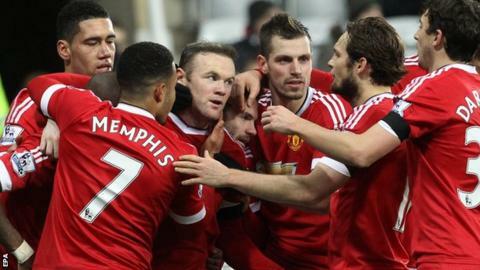 Derby's attempt to cause an upset against Louis Van Gaal's side kicks off a busy weekend of coverage on the BBC. Football Focus will be live from one of Saturday's standout fixtures, followed by FA Cup Final Score, Match of the Day, MOTD2 and climaxing with the FA Cup fifth round draw following Sunday's live match. The third-round replay between Leicester and Spurs will be shown live on BBC One on 20 January.